Skateboarding is an amazing extreme ride-on sport that requires agility, superior sense of balance, nerves of steel especially when performing high-flying stunts and tricks, and a passion for speed. Unfortunately, relying on your trusty legs and feet can be tiring. So, even if you can go tops at 80 miles per hour or even beyond that, you’d definitely have to train for it, just as what the current Guinness Book of World Records holder for the fastest skateboard speed in a standing position, Erik Lundberg did. Lundberg did an 81.16 mph record-beater, beating MischoErban by a mere 0.42 mph. That speed record however, was performed downhill on an 18-degree incline in Quebec. With gravity by your side, speed is no problem. What about something completely different. I mean, a skateboard with a gas powered engine! Now that’s cool right? There are several models on the market, and you can use these beasts on the road or off road. In fact, it is now a spot in itself to go off roading on a gas powered skateboard, and let me tell you, they are amazing! In this article, we will be examining two of the best in the industry. The SkaterXis probably the best gas powered skateboard when it comes to delivering a decent quality board for the money. 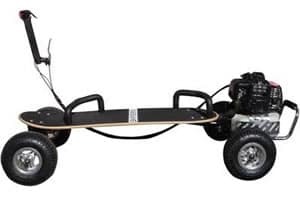 It has a great combination of on-road and off-road capabilities that should not only be a joy to take on any terrain but also lightweight and durable enough to let you perform a variety of tricks and stunts you would normally accomplish in a standard skate board. The SkaterX comes with a very powerful 49cc gas engine with enough force to take you up on a 15 degree incline without so much as the engine sputtering; telling you it’s near its chokepoint. And even when the gas engine is about to die down, its automatic centrifugal clutch keeps it running so you get optimum performance regardless of where you take it. Made of very thick wooden deck and reinforced with fiberglass suspension deck, the SkaterX will never give up on your need for death-defying stunts and maneuvers. No terrain is ever rough as the fiberglass suspension deck allows for optimum flexibility such that it beautifully absorbs all the shocks and impact forces the terrain can throw at it. While the SkaterX can only manage a meager 25 mph top speed, with added upgrades such as the HP filter and the X-pipe, you can actually tweak this best gas powered skateboard for sale to go up to 33 miles per hour. Many who have tried the upgrades recommend it for use among professional skateboarders only. Giving an all-terrain on-road and off-road performance for the SkaterX is its ultra-large dual sport tires that measures a full 9 inches in diameter and about 3.5 inches wide. Each tire is treaded with large knobs to give you superb traction regardless of the kind of terrain you’re in. The SkaterX also comes with a trigger throttle which simplifies operation. To accelerate, simply pull in the trigger. To decelerate, just release. Part of its rather slow, gradual braking is its use of a drum brake type of stopping mechanism. While this type of brake system is already considered almost obsolete, it is nonetheless preferred for a smoother, gentler, and more gradual stops rather than the abrupt stopping performance of disc brake systems. 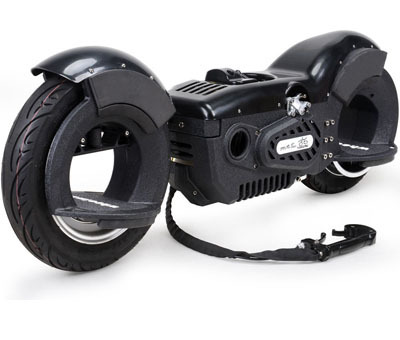 TheMotoTec Wheelman is not really a skateboard, but more like a futuristic wheel machine. You can see from the video above what it’s like to ride. Now in the video, the rider is not going full throttle, and this travels much fast, and will reach a top speed of 25mph which is not too bad. TheMotoTec Wheelmanlooks nothing like a skateboard since it has no deck or platform upon which you can firmly plant your feet on. Instead, the deck is beautifully integrated into its spokeless wheels. You insert your feet on those wheel wells and use these as your platform for maneuvering and running the Wheelman. The Wheelman is powered by a 50cc 2-stroke 2-horsepower gas engine that’s mounted squarely on the center of the aluminum frame. It comes with the same centrifugal clutch complete with its belt drive to power it. Because of its unusual design, riding the Wheelman typically means the rider will have to lean on one side to balance the positioning of his feet. Nevertheless, it really is a cool-looking machine and fun to ride on. Choosing the best gas powered skateboard for sale is just like picking any other ride-on toy or, more specifically, an ordinary skate board. For serious fans, however, it is more like choosing a mountainboard since the wheels on these gas powered babies are humongous. If you have a truck or an SUV, that would be your standard skate board. Change the tires to something like those on Big Foot or any other monster truck for that matter, perfect for smashing through other vehicles, and you’ve got for yourself a mountainboard. Now, imagine a mountainboard with engines that you can control and you’ve got a really awesome looking, mean ride-on machine that’s built for on-road and off-road adventures, thanks to its dual sport tires, and superbly built fiberglass suspension deck. Of course, this is just us. But if you really want to get your very own gas powered skateboard, then here are the things you need to look for. Engine – What’s the point of having the best gas powered skateboard for sale if you cannot even go well beyond 20 miles per hour? On the average, most gas engine mounted skate boards can go up to speeds of 25 miles per hour. These often come in 49cc to 50cc engine sizes with just enough power output to send you up to speed. Now, if you want more power, then you really need to get a much bigger gas engine, although the main issue is how you’re going to fit this in your rig. A better solution is to apply some upgrades. Equally important is the construction of the gas engine. Most come in highly durable aluminum blocks although some may be made of other materials. The make of the gas engine can have an impact on the speed that the board can achieve. Gas tank – If you have a gas engine, then you will definitely need a gas tank. Check the capacity of the tank. More importantly, you have to check the placement of the tank so it doesn’t get in the way of your riding experience. Furthermore, the construction of the tank is also important as it also needs to be protected against bumps and accidental punctures. Clutch mechanism – Most skate boards that are equipped with a gas engine come with a centrifugal clutch mechanism to keep the gas engine from stalling in instances when the output shaft slows down or is abruptly stopped. The centrifugal clutch mechanism also allows for the safer and more efficient disengagement of load when idling or starting. Throttle mechanism – The best gas powered skateboard for sale typically comes with a trigger throttle system which effectively minimizes the need for twisting the hands at the wrist if you get a twist-type throttle. Most trigger throttle mechanisms are operated by simply pulling it to accelerate. Brake system – If you accelerate using the trigger throttle mechanism, then you simply have to have a means to stop or slow down as well. Most gas engine skate boards come with either a drum brake system or a disk brake system. A drum brake is huge and has been in use for many decades. These are very easy to maintain since all of the individual components in a drum brake are held in place, within an enclosure, by spring tension. Replacing a drum brake is also cheaper. A disc brake system, on the other hand, provides better performance especially if you want shorter stopping distances after going top speed. A disc brake gives you the ultimate in stopping power and is a lot better at dissipating heat. These types of brakes are also easily inspected. One of the best things about a disc brake is that it is completely self-adjusting. So, if you are not really into speed and abrupt stops, a drum brake might appeal to you. However, if you prefer absolute stopping power, then a disc brake is in the offing. Deck – This has a lot to do with the skateboard’s weight capacity. Different brands can have a variety of decks. You can choose one that has a fiberglass suspension deck for superb flex, strength, and durability. However, these are often more expensive than other types of decks. Some also come in wood composites, typical of a standard skate board. There are also those that prefer other materials. Whether you choose a fiberglass suspension deck or some other material, it is best to look for its width and sturdiness so you get optimum stability while riding it. Weight capacity – As we have described above, this is a function of the deck, be it a fiberglass suspension deck or otherwise. The point is it should be able to accommodate your weight. Most boards can carry up to 220 pounds although it is not unusual for some to have a much greater weight capacity. Expansion capabilities – Think of the best gas powered skateboard for sale as your basic ride-on gizmo to take you where you want to go. That being said, try to consider choosing one that will offer you the leeway of expandability. For instance, if it will allow you to apply some adjustments or modifications later on, then that would really be great. Tires and wheels – Don’t forget the tires and wheels. You need a smooth rolling board so you can reach the speeds that you want. You will need bearings that can withstand the heat generated by the moving metal parts as well as provide you with a smoother ride. The tires are basically up to you. If you prefer riding your board on rough or uneven terrain, then getting tires that are large and with excellent all-terrain treads should be a great choice. If you want something more for the pavement, then choose one that has a finer yet equally strong grip on the asphalt. Customer reviews – The feedback of other people especially those who have already bought and tried the product should always be taken with a grain of salt. These are very subjective comments that are otherwise prone to personal biases. Nevertheless, these should give you a fair idea on how the best gas powered skateboard for sale is actually performing in real life. Price – Be prepared to shell out anywhere between $350 and $700 for a good gas powered skateboard. There are cheaper variants but these may not be at par with the best. There are also those that can reach up to a thousand dollars but you may have to think twice if it’s really worth it. The best gas powered skateboard for sale is undoubtedly SkaterX primarily because of its upgradeability. However, if you wish to ride on something that is truly futuristic, to say the least, then the Wheelman is worth considering.